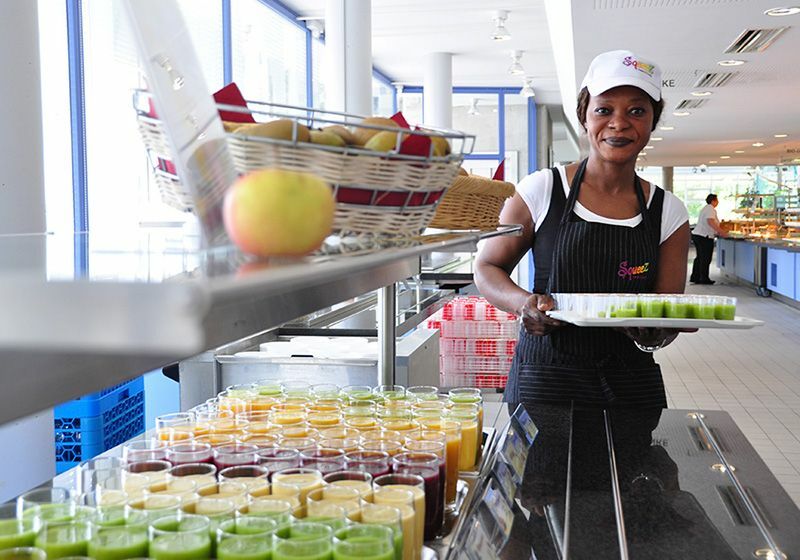 Our Mensa lunchrooms and cafeterias offer a wide range of high-quality dining options that are easily accessible and tailored to the needs of students and university staff. We strive to design our range of products and services in accordance with modern requirements for daily nutrition during times of work and study. Bright, friendly atmosphere with lots of light inside and a view to the outside. There are 450 seats in the dining hall. You will find 60 more seats on the gallery, which is accessible by a spiral staircase. 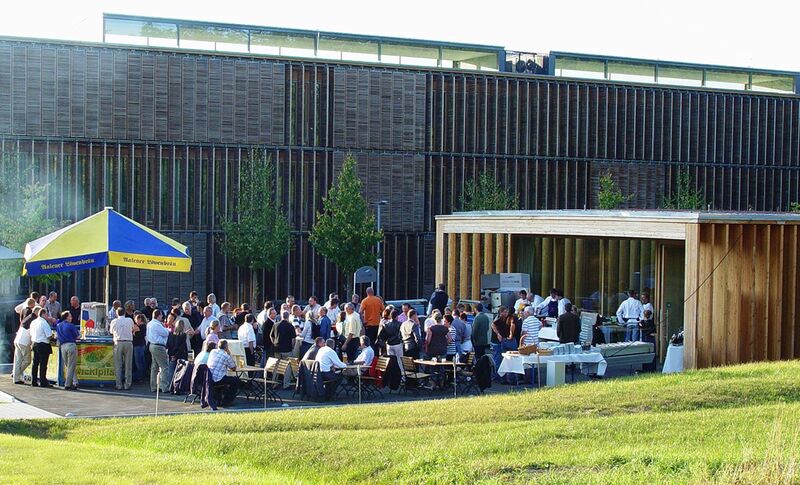 In 1991, the canteen received the Award for Exemplary Buildings by the Chamber of Architects, Baden-Württemberg. What we serve Soups, stews, main dish “good and low priced” or “delicious and fine”, vegetarian dishes, organic food, wok and grill dishes, different buffets, additional side dishes, fresh desserts, fruits and beverages. Opening Hours Mon - Thu 11.30 a.m. to 1.45 p.m.
Fri 11.30 a.m. to 1.30 p.m. Menu see “menu” here on the page "Speiseplan"
In the Cafeteria Southside opposite to the canteen you find a wide range of offers as well as an external (?) coffee station with two coffee vending machines for coffee specialties. Just around the corner there is a hot bar with meatloafs, cutlets, meatballs on offer. Or indulge yourself with a curry sausage or burger etc. straight from the grill. What we serve Various coffee specialties, hot and cold beverages, baked goods, cold and warm snacks, different kinds of salad, fruits, fresh muesli buffet in the morning, soups for lunch time, dairy products, sweets, note pads and newspapers. Mon - Thu 8.45 a.m. to 3.30 p.m.
Fri 8.45 a.m. to 2.00 p.m.
18 February - 18 April, 2019: Mon - Thu 8.00 a.m. - 6.00 p.m. / Fr up to 5.00 p.m. Menu see "menu" here on the page "Speiseplan"
You can enjoy a vitalizing meal in our Cafeteria B. Our chef prepares two delicious meals every day. Our “mensa vital” offers a balanced diet. Our dish “from pan and pot” (aus Topf und Pfanne) rounds off our range of meals. 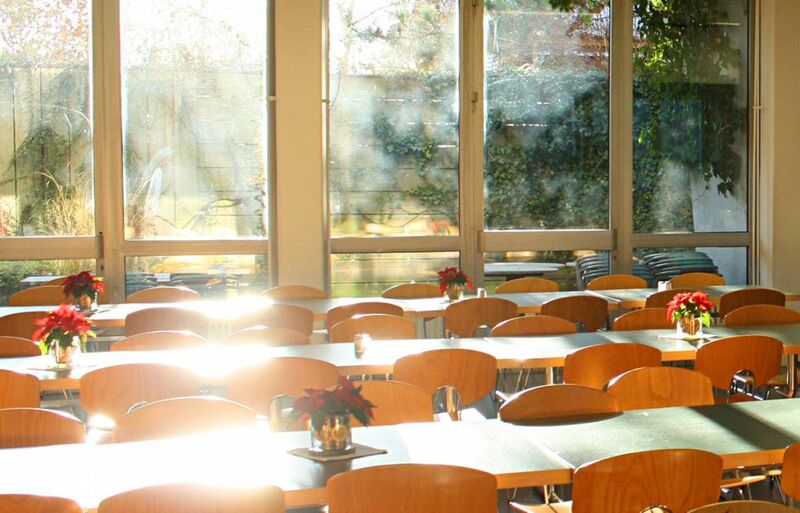 The cafeteria offers nice places outdoors. Here you can enjoy a latte macchiato in the sun in good weather. What we serve coffee specials, hot and cold drinks, baked goods, cold and warm snacks, different kinds of salad, dairy products, sweets, semester ticket, newspapers and parking tickets for the clinic's parking garage. At lunch time, two kinds of dishes are offered, one of them vegetarian. On select days, the dishes are organic. Vending machine with coffee, cold beverages, cold snacks and ice-cream. 18 February - 18 April, 2019: Mon - Fri 8.45 a.m. to 2.00 p.m. 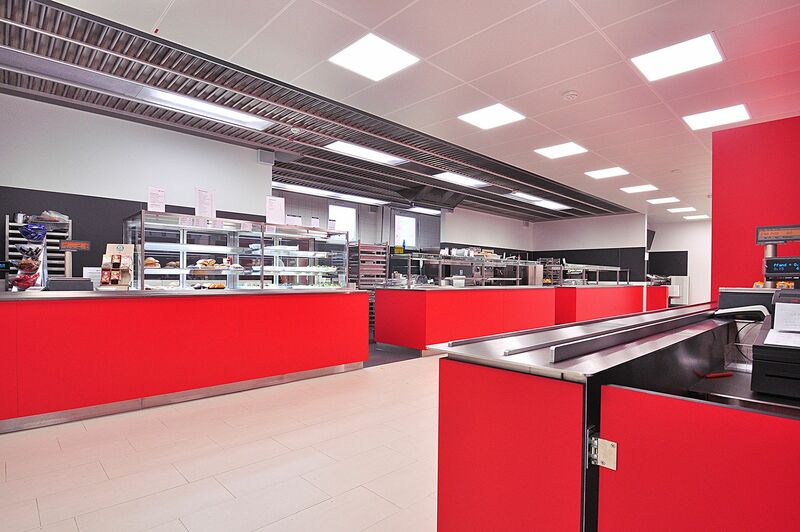 In our modern Uni Bistro upstairs the cafeteria SouthSide we offer a daily changing range of selected goods. During lunchtime you can choose between pizzas and pasta. Combining a fresh ambiance with the modern bistro furniture we offer you a dining experience on a completely new level. 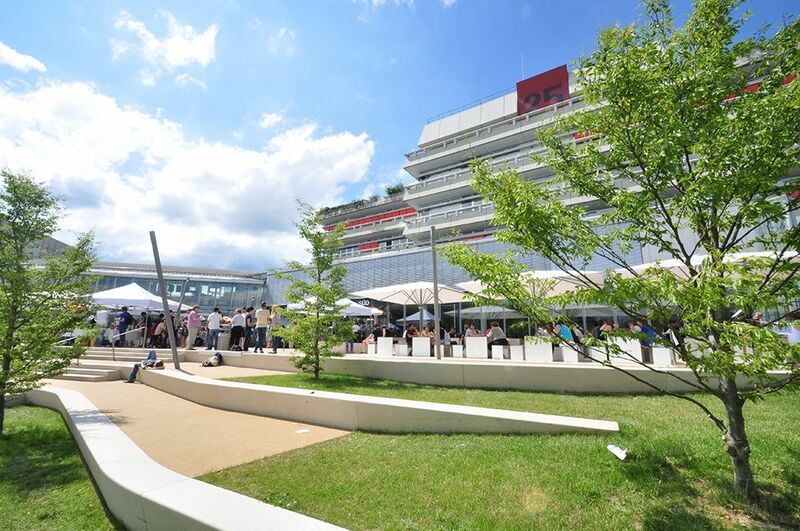 Outside lunchtime you can sit in comfortable furniture and learn or just linger for a while. What we serve Pizza, pasta, coffee specials, hot and cold beverages, baked goods and snacks. Mon - Thu 11.00 a.m. to 6.30 p.m.
Fri 11.00 a.m. to 2.00 p.m.
18 February - 12 April, 2019: 11.00 a.m. - 14.00 p.m.
You will find the coffee cube “Camppuccino” close to the foundation stone of the University Ulm. There you can enjoy a coffee specialty in stylish ambiance served in a porcelain cup. Here in stylish ambiance you can enjoy a coffee specialty served in a porcelain cup. 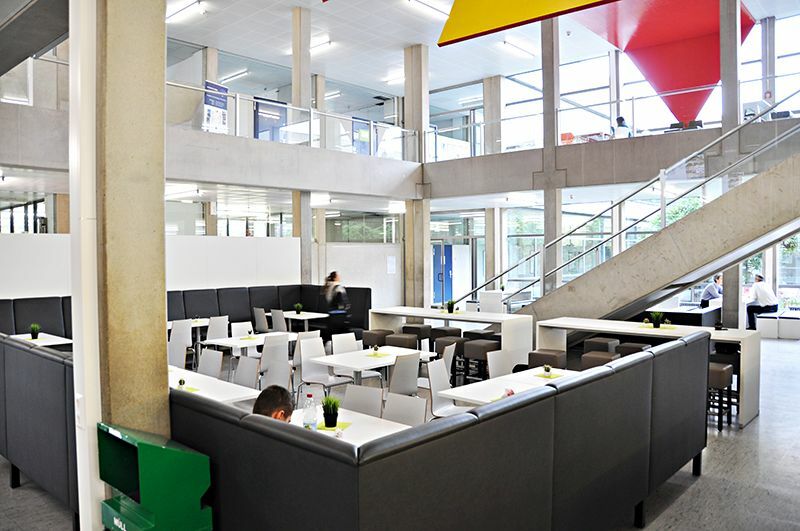 The newly designed study area of the university offers you seating options at shared tables as well as bar tables and a long counter bar. What we serve coffee specials, hot and cold beverages and snacks. Mon - Thu 9.00 a.m. to 2.00 p.m.
Fri 9.00 a.m. to 1.30 p.m.
18 February - 22 March, 2019: Mon - Thu 11.00 a.m. to 2.00 p.m.
25 March - 29 March, 2019: Mon - Fri 9.00 a.m. to 2.00 p.m.
1 April - 12 April, 2019: Mon - Thu 11.00 a.m. to 2.00 p.m. / Fri to 1.30 p.m.
Products coffee specials, cold drinks and snacks from the vending machine. Our smallest establishment with a familiar atmosphere. The stylish cafeteria of the university administration not only invites employees of the university administration but also guests of the surrounding institutes to enjoy a relaxing break. 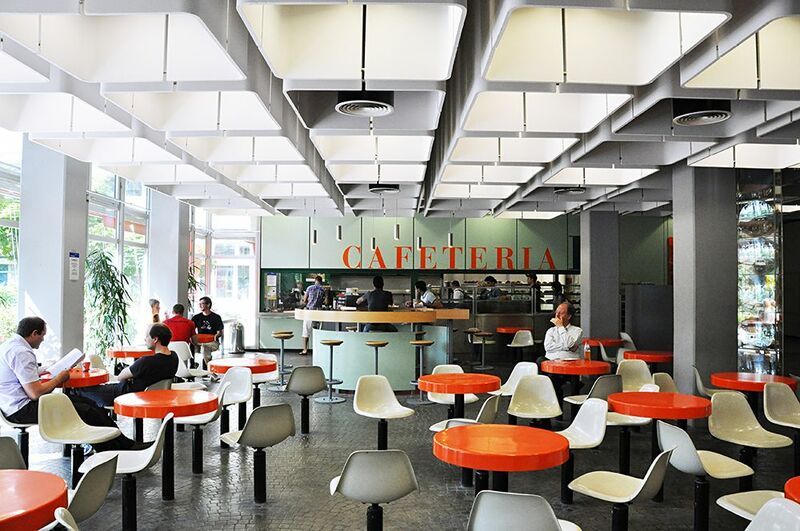 The special thing about the cafeteria is the generous proportioned seating, which even can be enjoyed in sunshine on the terrace. A small dish during lunchtime completes our offering. 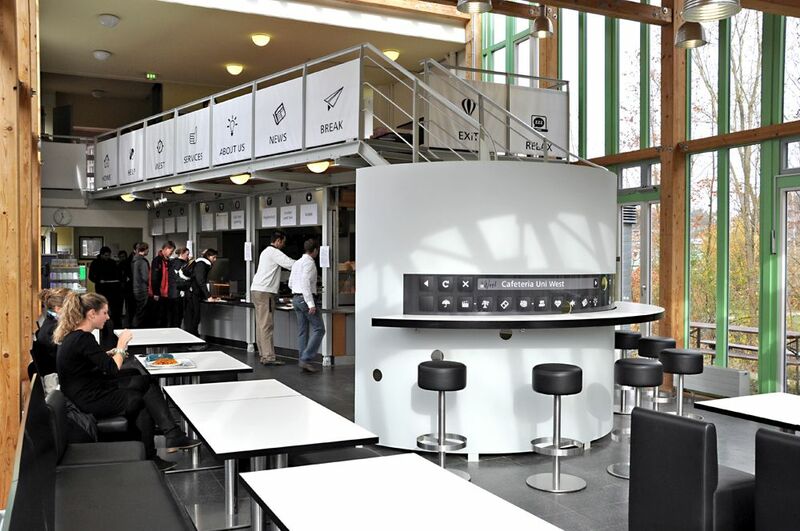 We also cater for the senate hall or other events of the university administration, serving food and drinks. What we serve Coffee specialties, hot and cold beverages, cold and warm snacks, different kinds of salad, dairy products and candy. At lunch time, soup, stew, one main dish (organic on selected days). Mon – Fri 9.00 a.m. to 2.00 p.m. 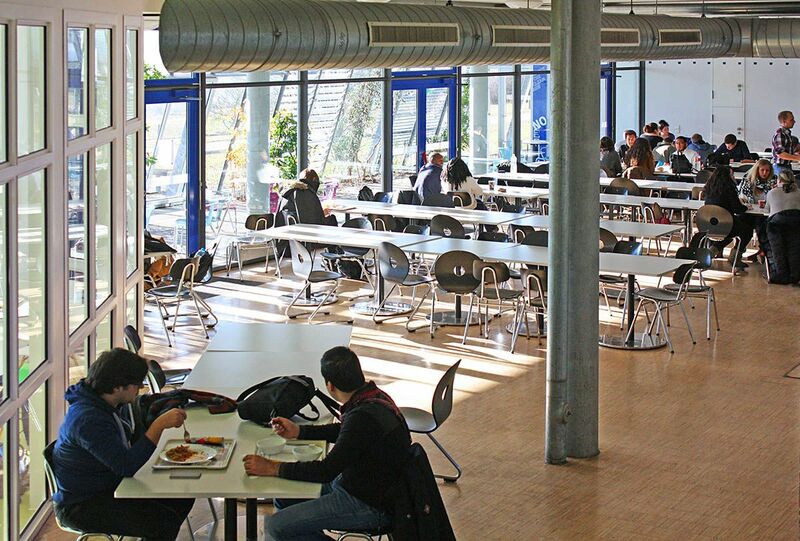 The Cafeteria of the University West is situated opposite the main entrance of the library. 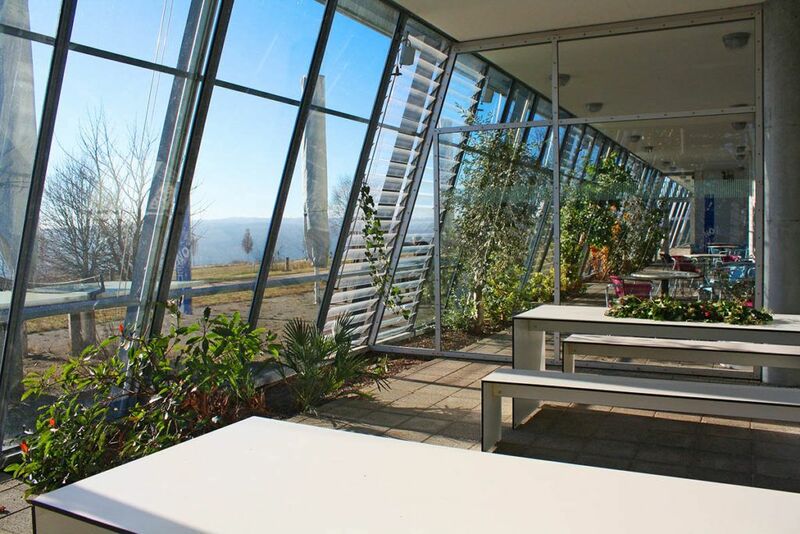 The newly designed Cafeteria with the flair of a winter garden offers you seats on two levels. There are three dishes with a choice of different components on the menu. On sunny days the terrace invites you to relax outdoors. What we serve Meal “good and affordable”, “delicious and fine”, vegetarian dishes, soups, side dishes, desserts, fruits, different kinds of salad, coffee specialties, hot and cold beverages, baked goods, cold and warm snacks. Mon - Fri 9.00 a.m. to 2.00 p.m.
18 February - 18 April, 2019: Mon - Thu 8.00 a.m. to 4.30 p.m., Fri to 2.00 p.m. 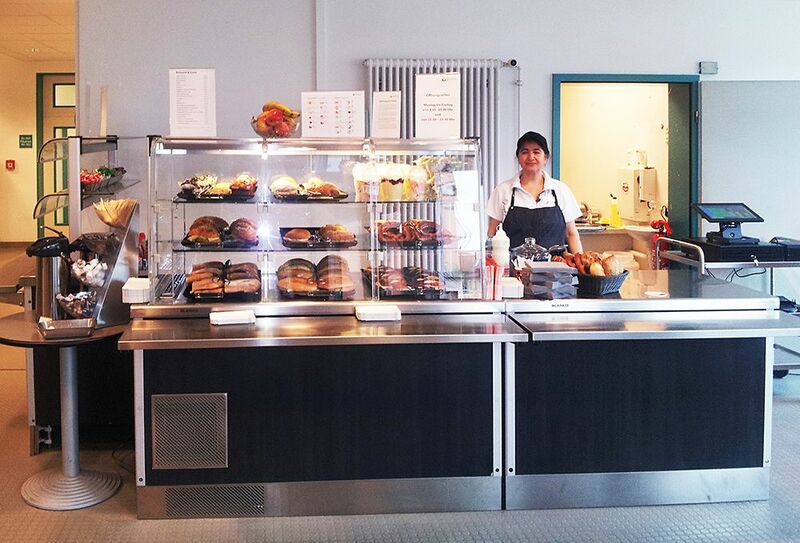 Meal Serving Counter Mon - Fri 11.30 a.m. to 1.30 p.m. Here you can enjoy a satisfying meal “almost in passing-by”. 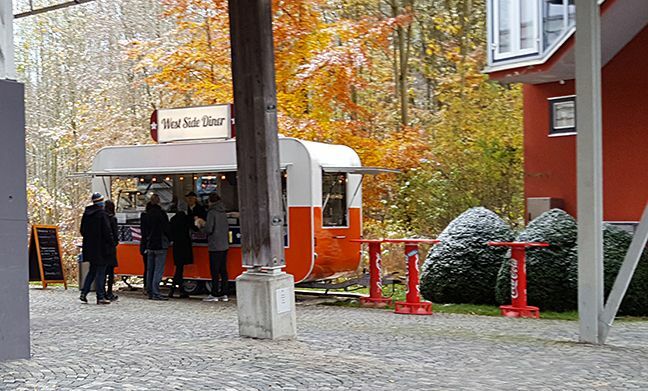 Mon - Fri 11.30 a.m. to 2.00 p.m.
Where to find us In the western part of Ulm University in front of building 45. 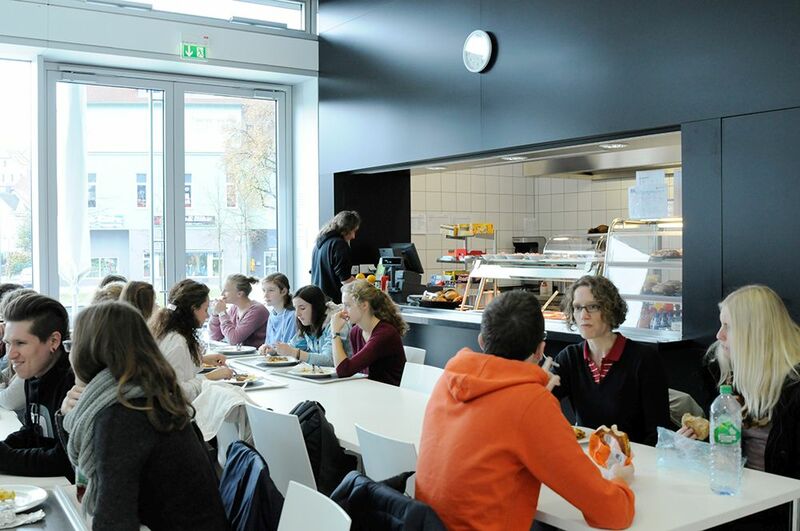 The energy-oriented refurbishment of the mensa lunchroom at the campus of the University of Applied Sciences and the replacement of the equipment led to an improvement of quality and the range of meals we serve. Now you can choose from a wide range of daily choice-meals. 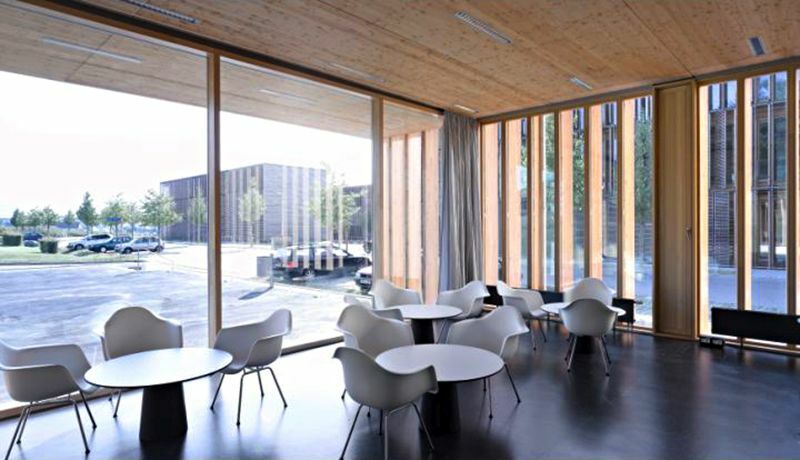 The large glass front of the windows and the new furniture create an atmosphere of well-being! What we serve The snack bar offers beverages, baked goods, snacks and confectionery. 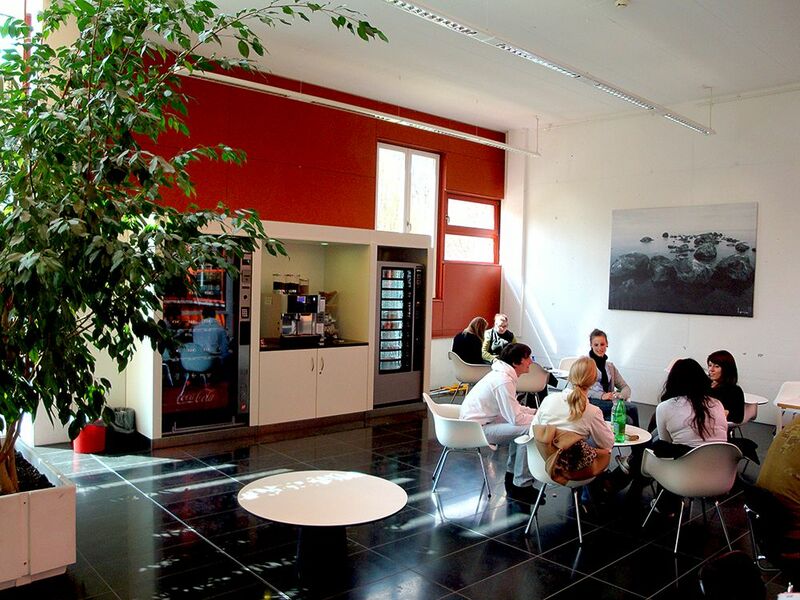 The building at Wilhelmstraße also has vending machines with coffees and cold beverages at the cafeteria. Mon - Thu 11.45 a.m. to 1.45 p.m.
Fri 11.45 a.m. to 1.30 p.m. 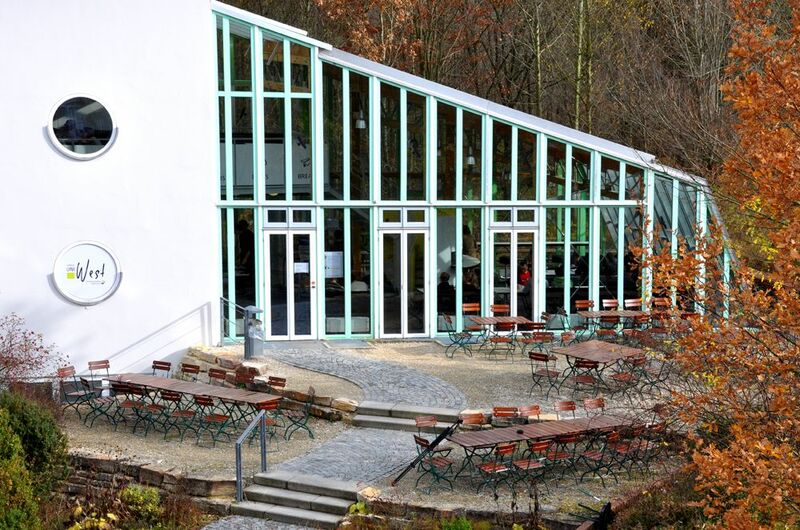 Shortened Opening Hours Cafeteria 18 February - 8 March, 2019: Mon - Fri 8.30 a.m. to 1.30 p.m. 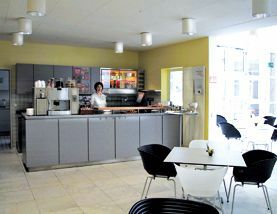 Opening Hours Cafeteria Mon - Thu 7.30 a.m. to 3.00 p.m. Break 10.15 to 10.45 a.m. Menu see "menu" here on page "Speiseplan"
The building complex of Ulm University of Applied Sciences was designed by architect Günter Behnisch and is listed as protected heritage. 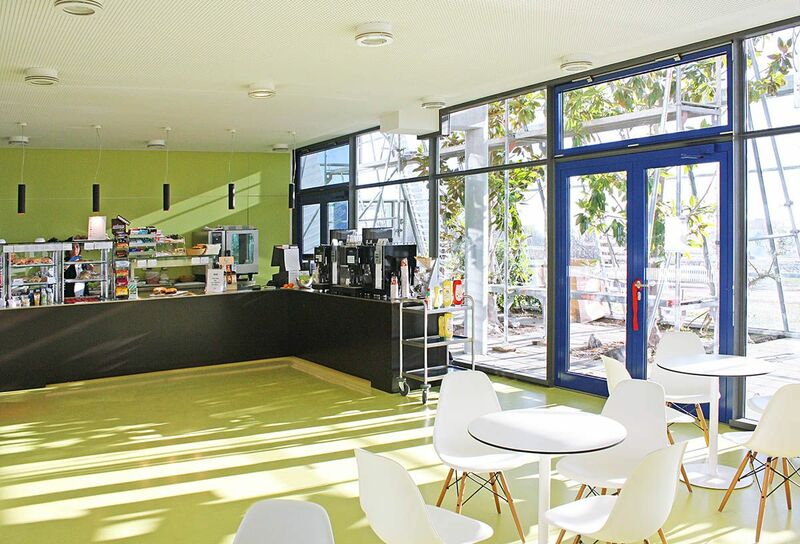 Our small but fine cafeteria is located in building B, offering a fresh atmosphere with bright yellow and cool blue colors inside and green views on the sunny terrace outside. 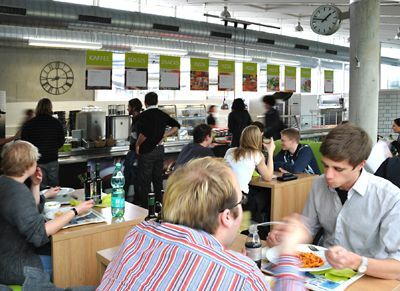 The cafeteria on the satellite campus in Böfingen has a wide range of snacks and two meal options for lunch. The small terrace offers balmy shade on hot days. What we serve Coffee specialties, hot and cold beverages, baked goods, cold and warm snacks, salad, sweets. During lunch time, two main dishes are offered (one vegetarian), organic on select days. Shortened Opening Hours 11 February - 15 February, 2019: 11.30 a.m. - 1.00 p.m.
Our modern coffee lounge "Kiwi" is located in the basement in the former senate hall. What we serve Hot and cold beverages, baked goods, cold and warm snacks, salad, dairy products, candy. During lunch, two main dishes are offered, one of which is vegetarian. Organic choice on select days. Opening hours Mon - Thu 7.30 a.m. to 4.00 p.m. Shortened Opening hours 18 February - 11 March: Mon - Fri 9.30 a.m. to 2.00 p.m. 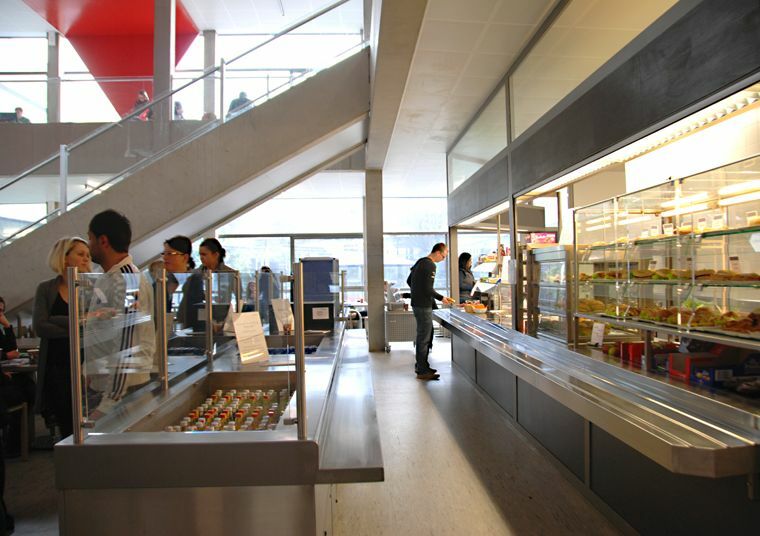 The food counter is located in the basement of the building. 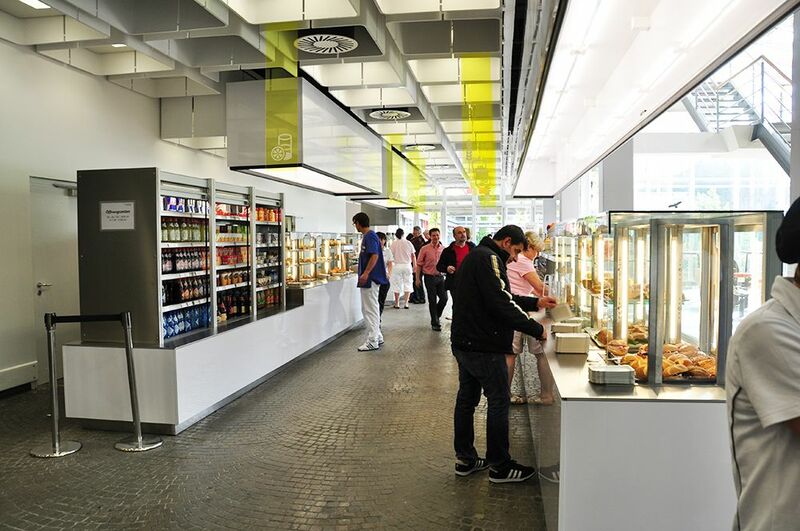 There is a space with vending machines offering cold beverages, assorted coffees, confectionery and ready-made salads on the 1st floor. What we serve We serve 3 different meals, one vegetarian as well as one in organic quality. Food Counter Mon - Fri 11.30 a.m. to 1.45 p.m. Menu find the menu here on the page "Speiseplan"
The mensa lunchroom was designed by architect Günter Behnisch as an independent building, similar to the main building of the university. 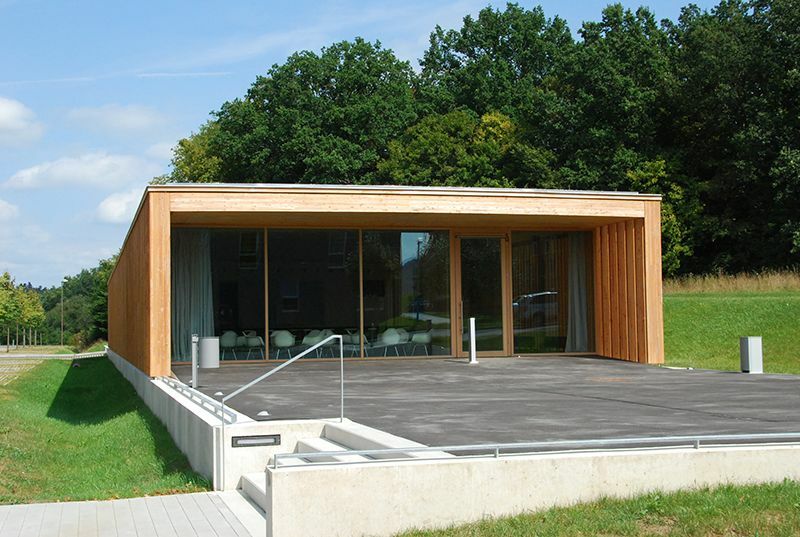 A short footpath connects the mensa with the university. The beautiful seating arrangements in the dining hall and on the southern terrace make for a pleasant experience during summer. 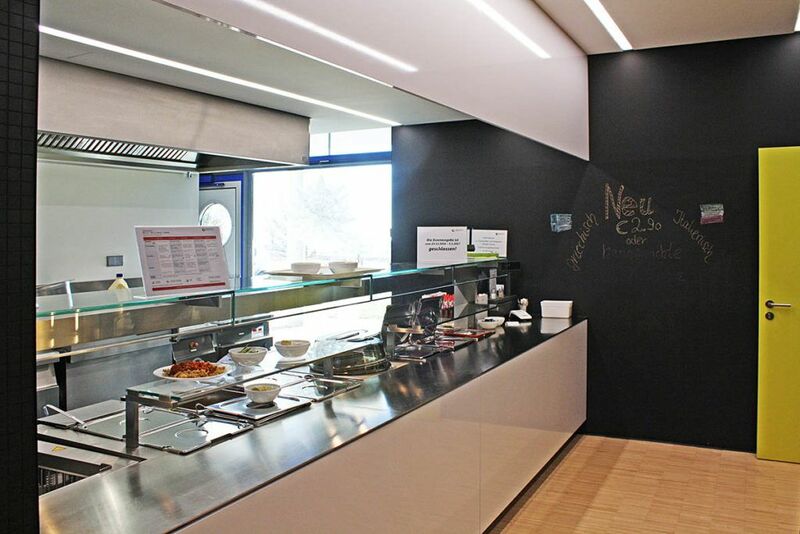 The Mensa has a food counter where you can choose from various components to create your own meal to suit your taste and appetite. What we serve Soup, main dish “good and low-priced” or “delicious and fine”, vegetarian dishes, different kinds of buffet, side dishes, fresh dessert, fruits and beverages. 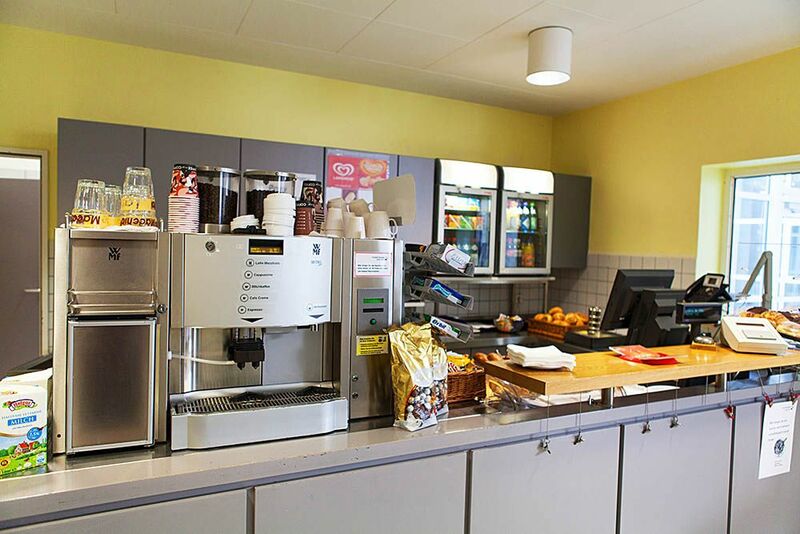 At the dining hall entrance, coffee and ice cream vending machines are available. 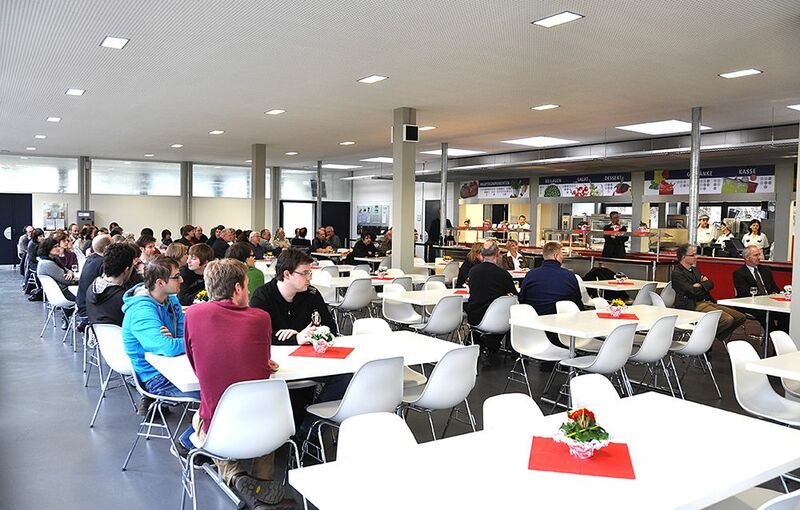 On the ground floor of the university building is our cafeteria with its wide range of offers. Seating is available downstairs in the cafeteria or on the gallery. On warm days, the places outside are very popular. 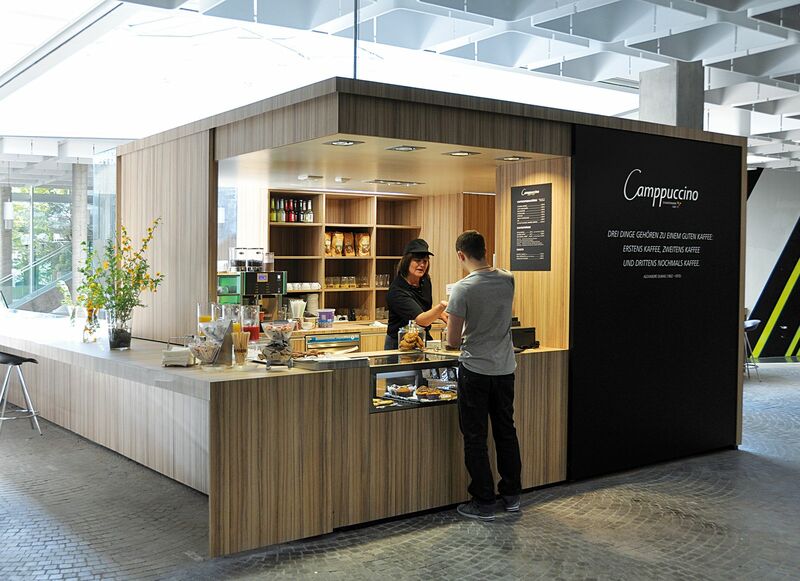 The separate coffee station provides assorted coffee specialties which you can buy with your chip card without having to wait in line at the check-out. What We Serve Assorted coffee specialties, hot and cold beverages, baked goods, small warm meals, cold and warm snacks, soups, fresh fruits, various salads, fruit salad, dairy products, confectionery. Vending machines selling confectionery, ice cream, cold and hot beverages. Shortened Opening Hours 28 January - 15 February: Mon - Fri 7.00 a.m. to 4.00 p.m.
18 February - 8 March, 2019: Mon - Fri 7.30 a.m. to 2.00 p.m. 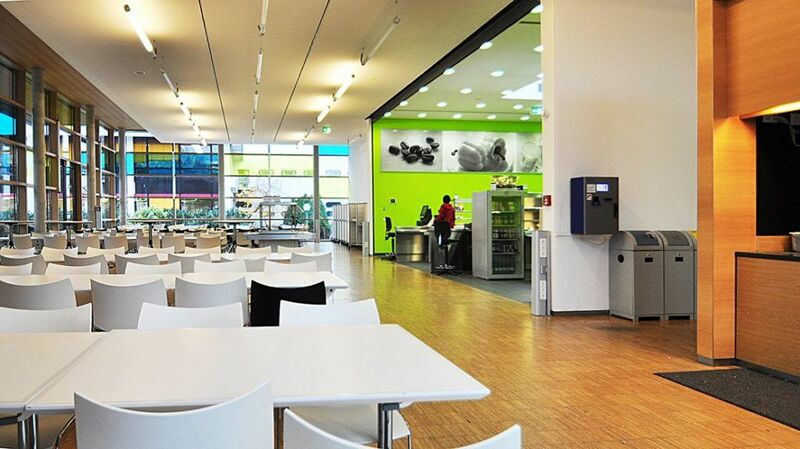 This cafeteria is a solitary-standing, well-designed building with a beautiful terrace – a fantastic asset. The guest room also serves as study area. 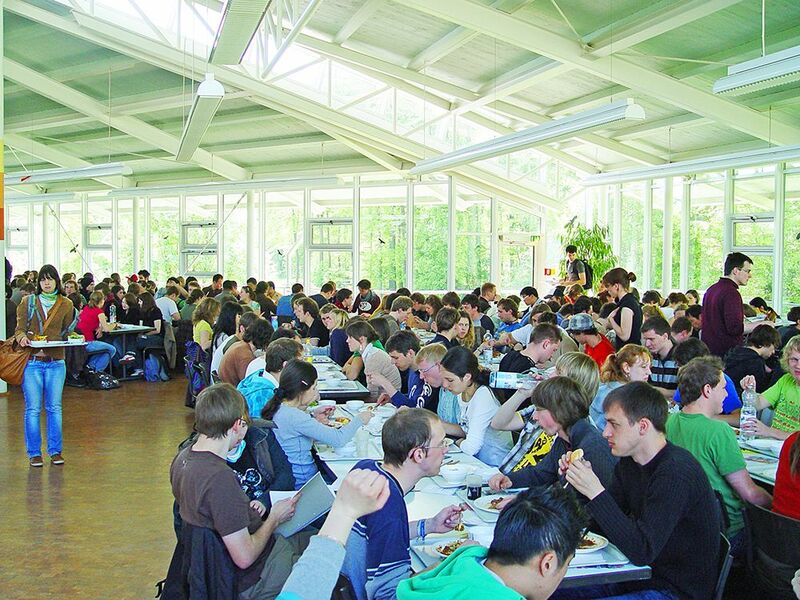 During lunch hours, we serve one meal with meat and one vegetarian option from the Mensa at discounted student prices. What we serve Assorted coffee specialties (separate coffee station), baked goods, hot and cold beverages, cold and warm snacks, various salads, muesli, fresh fruits, fruit salad, dairy products, confectionery. Vending machine stations offer: Ice cream and cold beverages inside the cafeteria, confectionery, snacks, hot and cold beverages in building I. Shortened Opening Hours 28 January - 15 February, 2019: Mon - Fri 8.30 a.m. to 1.30 p.m. Menu see "menu" hier auf der Seite "Speiseplan"
In addition to a wide range of cafeteria products, the Mensaria has a food counter where you can choose from various components to create your own meal to suit your taste and hunger. You can buy assorted coffee specialties or hot chocolate cashless at the separate coffee station without having to line up at the check-out. What we serve Assorted coffee specialties, hot and cold beverages, baked goods, cold and warm snacks, assorted salads, fruits, dairy products, confectionery. 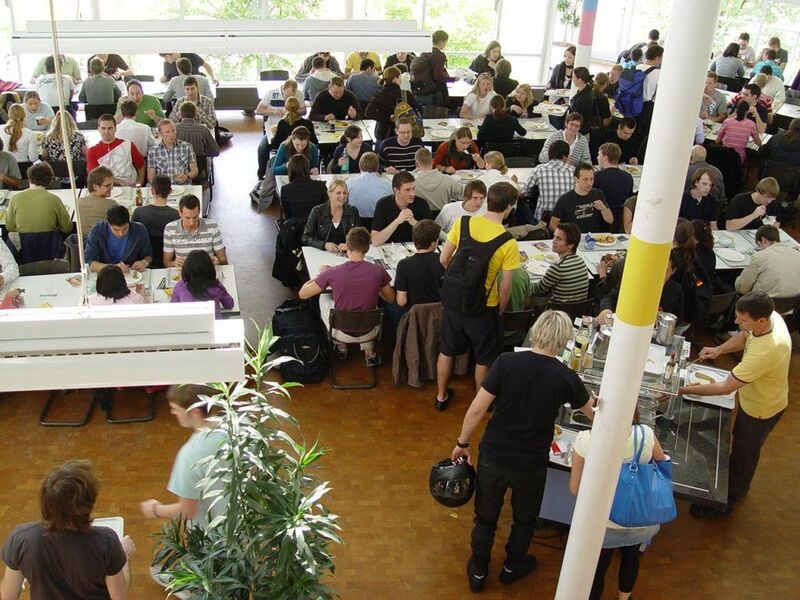 During lunch hours: Soups, the options "Gut und Günstig" (cheap and cheerful), "Prima Klima" (climate-friendly), "Gourmet", "Schneller Teller" (quick plate), vegetarian dishes, organic dishes, specialties from wok and barbeque, assorted buffets, various side dishes, fresh desserts and fruits. Opening Hours Mon - Thu 7.45 a.m. to 4.30 p.m.
Fri 7.45 a.m. to 2.00 p.m. Shortened Opening Hours 11 February - 29 March, 2019: Mon - Fri 9.30 a.m. to 1.30 p.m.
1 April - 5 April: 9.30 a.m. to 2.00 p.m. Lunch Hours Mon - Thu 11.30 a.m. to 2.00 p.m.
Fri 11.30 to 1.30 p.m.
Three meal options during lunchtime with one vegetarian option, partly organic quality. Lunch Hours Mon – Fri 11.45 a.m. to 1.30 p.m.
Payment Options Cashless ID payment option only. 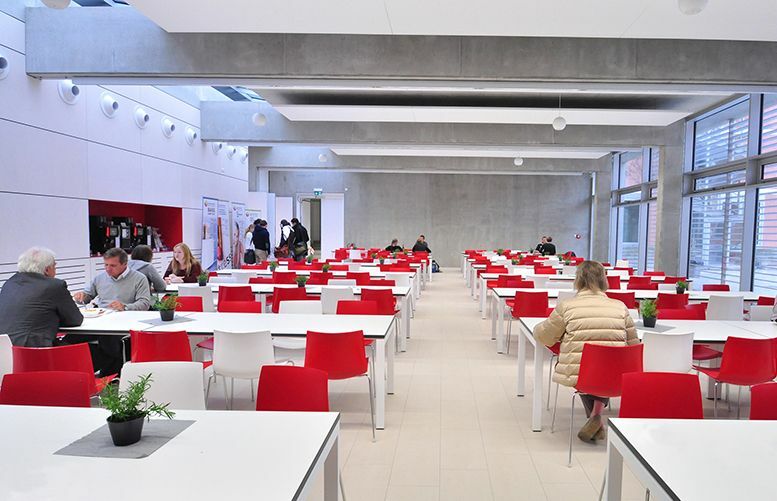 In 2016, we opened a Mensa in the newly renovated building of Biberach University of Applied Sciences. 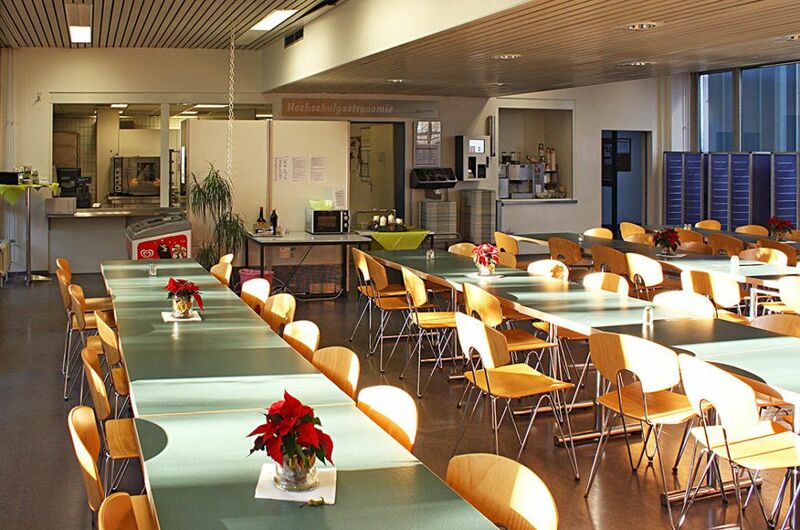 What we serve A wide range of cafeteria products, like assorted coffee specialties, hot and cold beverages, baked goods, cold and warm snacks (incl. vegan options), salads, incl. take-away, dairy products, freshly made muesli, fruit cups, confectionery and desserts. During lunchtime, the Mensa lunchroom now offers a selection of three different dishes. We also regularly serve specialties prepared on the barbecue, in a wok or in a pizza oven. 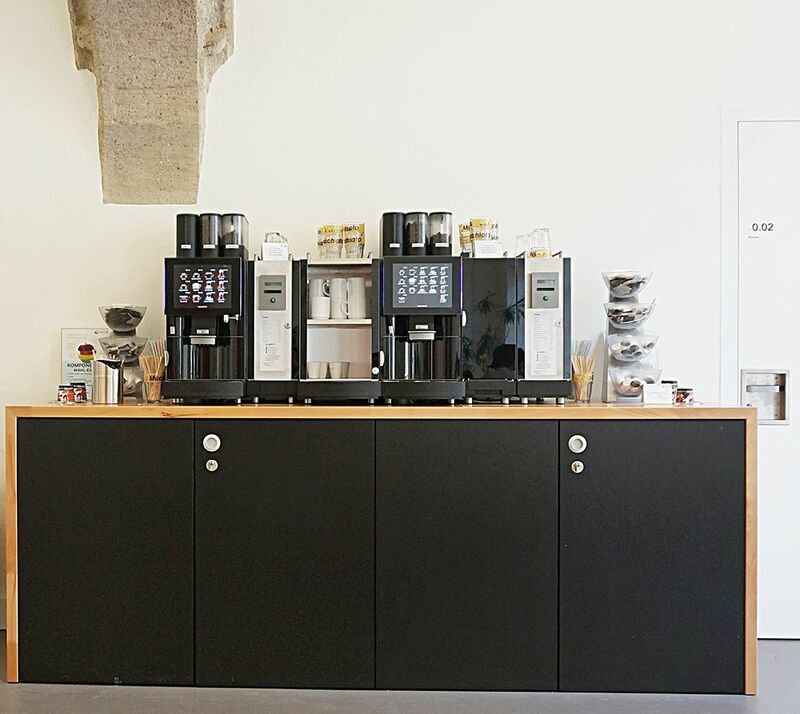 The integrated coffee station offers a wide range of assorted hot beverages. 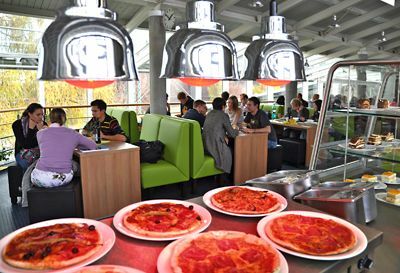 Since October, we offer a morning snack bar (9.15 am - 9.45 am) and a warm lunch during lunchtime (service times 11.45 am - 1.30 pm) during lecture periods on PBT Campus Aspach. Opening Hours Mon - Thu 7.30 a.m. to 5.00 p.m.
Fri 7.30 a.m. to 2.30 p.m. Shortened Opening Hours 28 January - 8 February, 2019: Mon - Fri 7.30 a.m. to 3.30 p.m.
11 February - 22 February, 2019: Mon - Fri 7.30 a.m. to 3.00 p.m.
25 February - 8 March, 2019: Mon - Fri 9 a.m. to 2.00 p.m. Lunch Hours Mon - Thu 11.30 a.m. to 1.45 p.m. 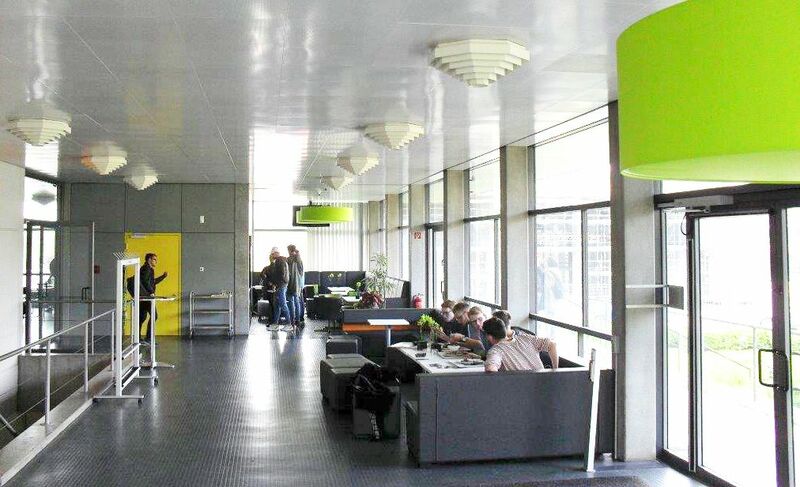 The Baden-Württemberg Cooperative State University (DHBW) in Heidenheim was founded in 1976 as a higher education institution with professional orientation and on-the-job-training. What started out with 35 students, has now grown into a university with 2380 students. What we serve The modern cafeteria sells an assortment of warm and cold, sweet and savory snacks with various fillings like pita bread, ciabatta, pizza pastry, danish pastry, muffins, salads, fresh fruit cups, muesli, shakes, confectionery and beverages (juices, soft drinks and coffee) as well as a daily choice of lunches, partly in organic quality. There are also vending machines selling cold beverages and assorted coffees. Opening Hours Mon - Fri 8.00 a.m. to 3.30 p.m. Lunch Hours Mon - Fri 11.30 a.m. to 1.45 p.m.